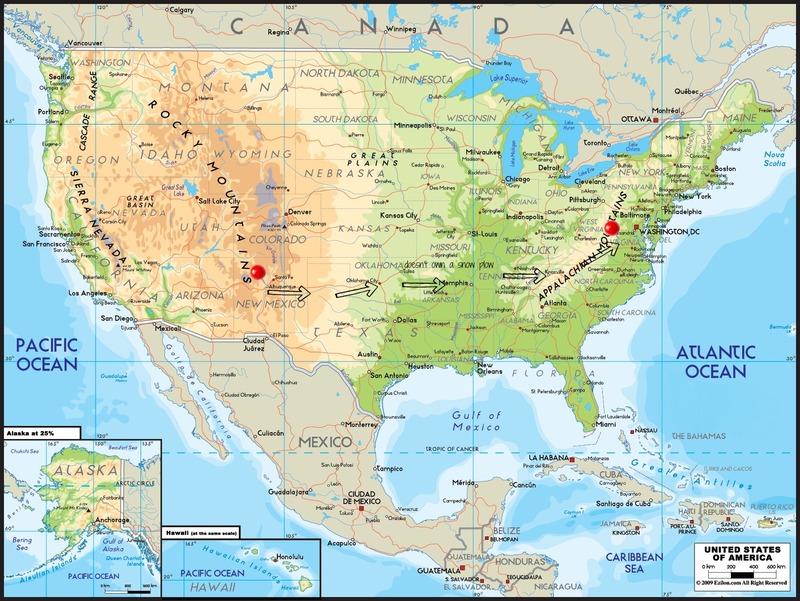 Thanks to everyone who encouraged me to write about our journey from Albuquerque, New Mexico to Lexington, Virginia. Here you go. On December 6th, after months of planning, we were ready to drive across country. We had gone to closing on our house the day before and the new owners were scheduled to move in at Noon. 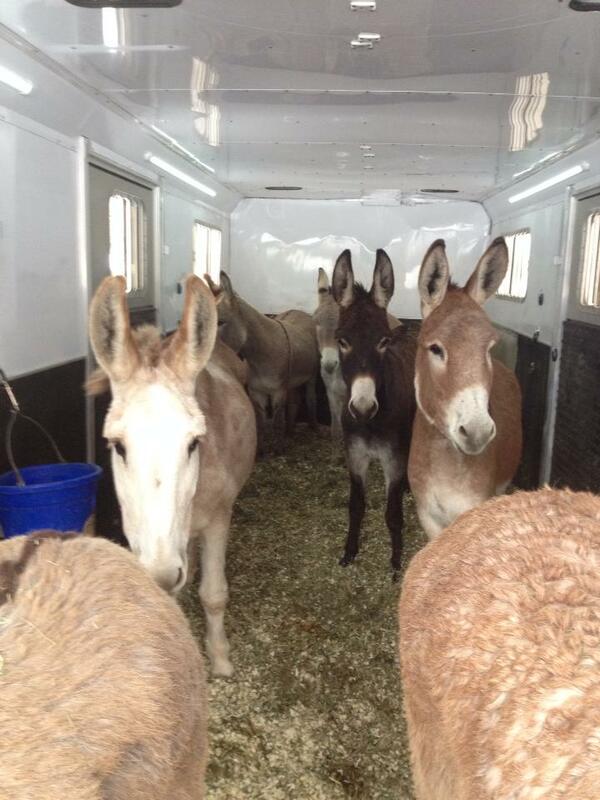 Knowing that 1,700 miles would put significant stress on the donkeys, we made the decision to hire a professional hauler to move them from Albuquerque to Lexington. Celso Rubio of Sin City Hauling out of Las Vegas, NV is an excellent hauler who took extremely good care of our herd. 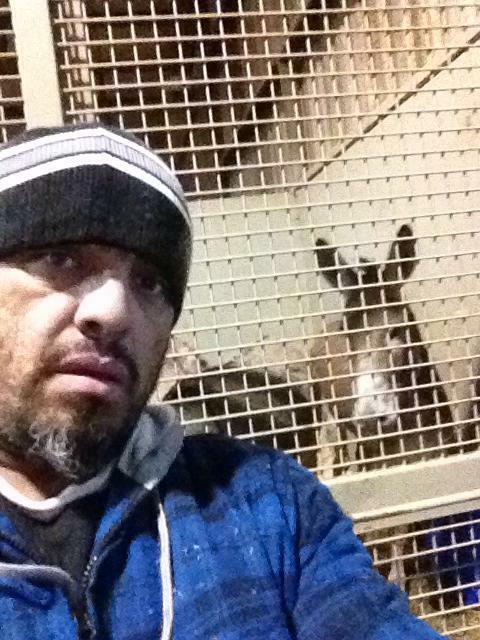 Celso arrived in Albuquerque at 6 a.m. ready to load donkeys onto his rig. It was bitterly cold and snow covered the ground. He backed his trailer up to our corral and we were able to run the herd onto his trailer. (One of the things that we mistakenly allowed the movers to pack and take with them was all of our tack, so we had no choice but to run them in. I felt horrible.) Poor Gracie was the most visibly affected as she stood in the trailer shaking like a leaf. I wondered if she thought she was going through another roundup situation. As we said farewell to Celso, I hugged him and burst out sobbing as I said, “Please take care of my babies!” I knew he would (thanks to the recommendations from our friends Dorothea and Paula), but the thought of not seeing them and knowing that they’d be under stress for a couple of days was more than I could bear at the moment. Watching him drive off with our herd was surreal. After saying good-bye to our old house and farm, we loaded the dogs and Meggie Moo into our vehicles and got on the road around 9 a.m. I was in my truck with my mom (who had flown from Maryland to help out and drive back with us) and four dogs, and was pulling a trailer with Don’s motorcycle. Don was in his truck with Whisky and was pulling our horse trailer, which was filled with bales of New Mexico hay and Meggie. Driving out of Albuquerque and up into the East Mountains, I watched the temperature plummet. As we drove through Moriarty it was minus 5°F – not counting wind chills – and I felt so bad for the Moo. We sat in accident traffic (a tractor trailer had careened off the road) for a couple of hours before crossing the border into Texas. Pulling into a truck stop in Amarillo, we had to navigate a pothole that spanned the entire entrance. Don’s truck and the horse trailer slammed into the hole with enough force to first unlatch the trailer then bounce it off the ball hitch. Dragging the trailer by its safety chains, we got it to a flat spot and had to figure out a way to get it back on the truck. The trailer jack – even extended all the way – was about two inches too short, so we ended up using the jack from Don’s truck to get the trailer up high enough. We had planned to make the trip to Virginia in two nights/three days, but took a day longer due to unforeseen circumstances and the weather (we were in the middle of winter storms Cleon and Dion). Instead of making it to Little Rock the first night, we stopped in Oklahoma City. December 7th was the worst day of our trip. 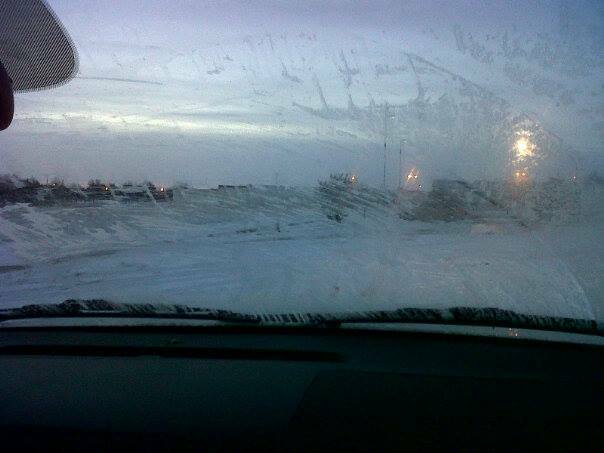 We woke up to more frigid temperatures and continued ice and snow on the roads. Because the roads were so treacherous, we were convinced that Oklahoma doesn’t own any snow plows. Thankfully the roads were virtually empty and we were able to plod along I-40 at about 20 miles per hour. I can’t tell you how many cars and trucks we saw that had spun off the highway and how many tractor trailers that had jackknifed or flipped. It was heartbreaking. I’ll never forget seeing a big RV that had smashed into a million pieces in the median and the family that was picking through the wreckage. They might as well have lived through a tornado from the looks of it. December 8th. We woke up to more ice; freezing rain had fallen overnight. I seriously questioned whether I could drive another day in those conditions. Because we knew Celso was planning to get the donkeys to Lexington that day and because we were expecting our furniture to be delivered on December 10th, we pushed on. As we got out of Arkansas and into Tennessee, snow and ice turned into rain and fog. It was so foggy in Memphis we couldn’t see the Mississippi River as we crossed it. After Don had a fishtail incident and I watched him and the horse trailer almost permanently lose control, we decided to stop in Knoxville, Tennessee that night. That was the night I caught Meggie eating toilet paper in the Motel 6 bathroom and I was so happy to think that we would finally be “home” tomorrow. 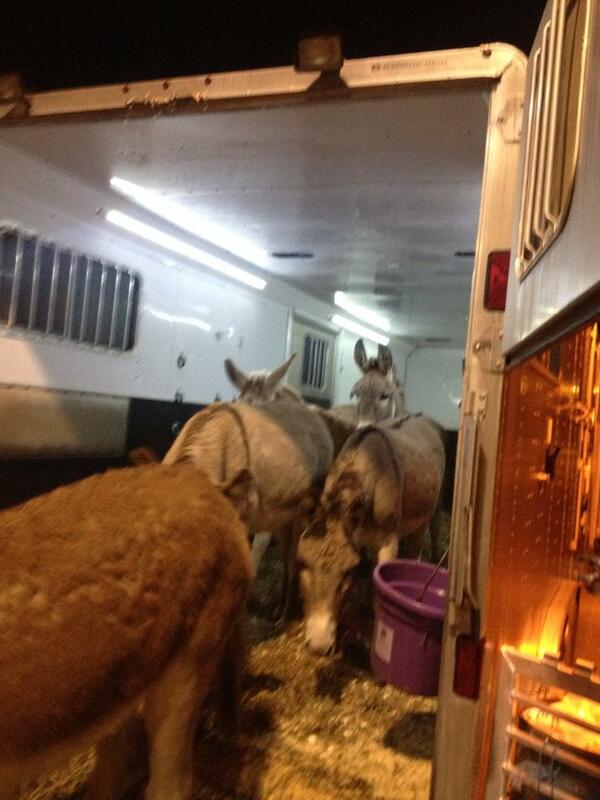 True to his word, Celso got the herd safely delivered to Virginia late the evening of December 8th. Because we knew that Celso would arrive with the donkeys before we did, we made arrangements for him to deliver them to the Virginia Horse Center, which is just down the road from us. They were so kind and accommodating and took such good care of the Boyz, Gracie and Harriet. We can’t recommend Celso – and his heart of gold – enough. He provided us with constant updates throughout the trip, which was a godsend. December 9th. After about five more hours of driving, we finally arrived in Lexington. One of the first things we had planned was to go and get the herd from the Horse Center and bring them home. Unfortunately, because it had rained so much the previous few days, Don’s truck and the horse trailer got stuck in the mud at the barn when we drove down to unload hay. We knew there was no way we could take the trailer with the weight of seven donkeys down the hill, so we had to come up with a new plan. 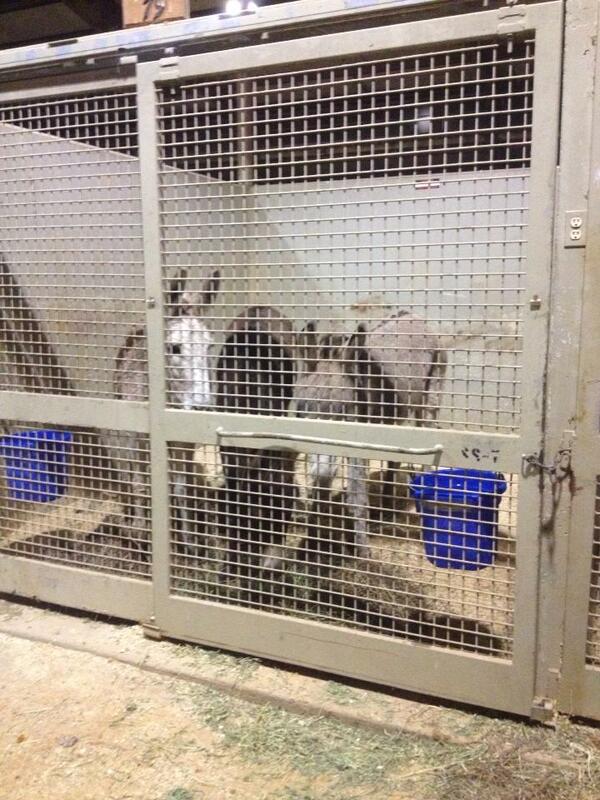 We went to visit the herd at the Horse Center and vowed to get them home the next day. After a trip to Tractor Supply to buy new halters and lead ropes, we planned to bring the herd home in two trips rather than one. We put Bernard, Patrick, Buck and Harriet in the first load because we knew we could park the trailer up at the top of the hill and lead them down to the barn. Sure enough, we did… with no trouble at all. We then went back for Ellsworth, Nigel and Gracie. Without a doubt, Ellsworth would have walked down the hill with the others in the first load, but Nigel and Gracie needed him for moral support. When Ellsworth got right on the trailer at the Horse Center, we hoped that Nigel would follow. Nope. Nigel refused to get on the trailer, no matter how hard we tried to persuade him it was okay. We ended up letting him go and letting Gracie out to see what she would do. Gracie jumped right into the trailer and Nigel followed right behind. Whoo-hoo! When we got them home, because there wasn’t as much weight on the trailer, we were able to back them down to the barn and release them right into the pasture. Oh, this was great reading. Driving in those conditions required nerves of steel. You and Don can pat yourselves on the back for making it through in those driving conditions. The herd, all in all were also remarkable and thank God for the man that transported your babies for y’all. Oh yes, what a great adventure for all of you! That must have been a hard decission but is also a big chance for a new beginning. This was a wonderful report to read during my break at work. Wave wave to new Morning Bray Farm! Good grief! Moving is always awful, no matter how much planning goes into it, right? (It must be some kind of universal law). I’m so glad that you all made it safe and sound. Oh, what a beautiful pasture for your herd! They must love it. Thank you for this wonderful post. 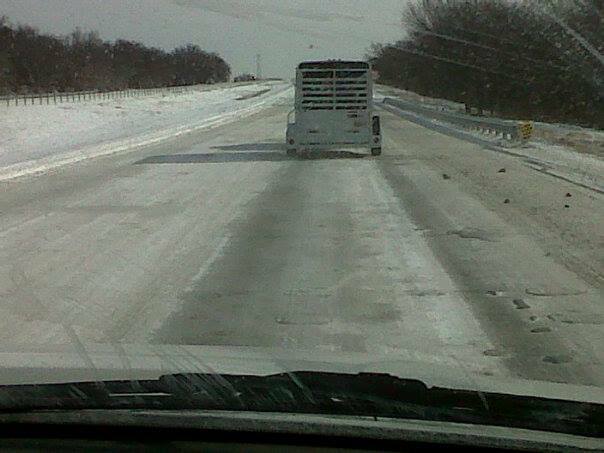 Thank you for sharing this travel across the nation with your family and herd. I was wondering how one does this move. Glad all made it safe and sound to your new home! So very glad everyone made it safe home! Weather-wise, your trip seemed almost doomed. I’m sure Gracie did learn a lot about trailer riding during that trip, and maybe it helped her overcome her fears for good. What an adventure, thanks for the story of th e move, it looks like a great place forr the family. Beautiful rolling hills and in a few months lots of fresh green grass. Even though this was a stressful time for you and the rest of your family, it sounds as if it went as well as it possibly could under the circumstances. 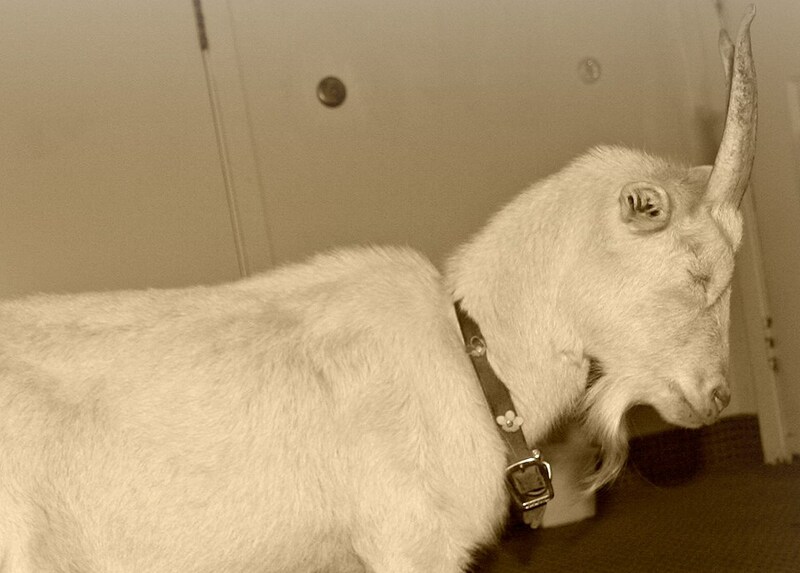 I will be smiling for days over the thought of a goat in your motel room. Welcome to Virginia! Yowsah. I knew it was a tough trip but some of these details (the hitch-disconnecting pothole) are new. All my worrying was justified! And I worry about how to move across country with three cats by myself. Silly me….you guys did an amazing job. 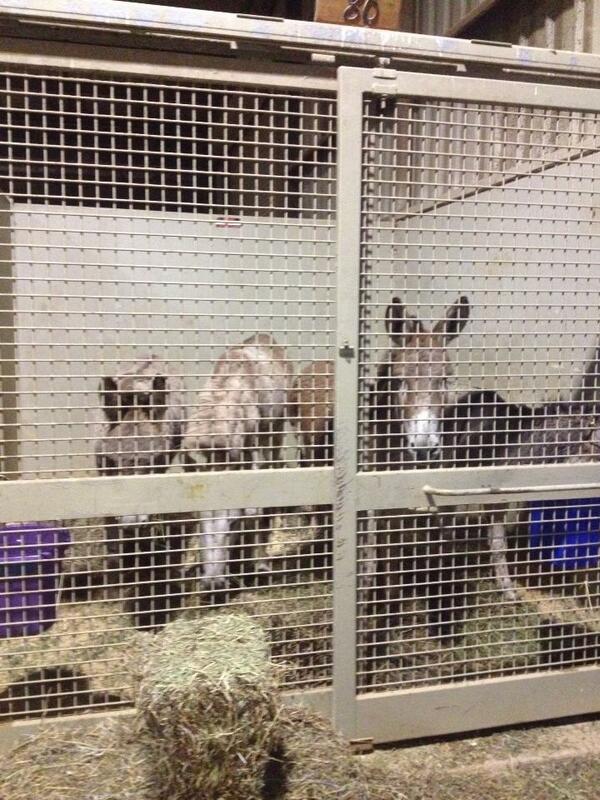 Bigger question is how are the animals adjusting to all of this cold and ice and endless snow in their new home. And I guess I should ask the same of you. Hardly the same as the winters in Albuquerque….at least no for the twelve when I lived there. I’m keeping your post handy for moral support. I’m so glad I didn’t know the harrowing details of your saga before now ! Makes me doubly happy that you are all safely settled in now !!! Yes, Bibi, I agree that it would have been even more difficult than it was had we known what a hard trip it was. I was so relieved to know they had all arrived safely (and so sad/angry that they had to camp out for so long without any of their belongings!). Thank you, Justina! Now will you tell us a bit about your new life? What an adventure to look “back” on fondly……… at the time not so much……….!!!! Driving in those conditions especially with all the “fur” kids relying on you is so stressful. Thanks for telling us about the big adventure. It was difficult for you to get them in the trailer for the journey, but oh the greeting you must have gotten when the herd saw you at the Horse Center! God I HATE moving! Especially across country. No matter how much planning you do, there are always a few wrenches thrown in the works! I’m so glad you are writing this blog. I love to see what you guys are up to. We miss you and I think about our last crab boil together and get very hungry! Love you. That was a tough trip- who knew the weather would be so nasty everywhere at the beginning of December. You did a great job navigating those icy roads. Oh Nigel! I guess he didn’t want to be left all by himself once the other two were loaded! Had to laugh at Meggie in the motel though! They sure have a nice place to live now. So glad you are all safe and sound after your harrowing trip! Good grief! What AWFUL weather. Hooray for Celso and Motel 6, who sound like the heroes of the saga! WOW! I don’t even have words! What a trip! It must have felt like an eternity to you! That was SO wonderful of your hauler to send you updates! I’d have been going out of my mind without them, especially with knowing how treacherous the roads were. 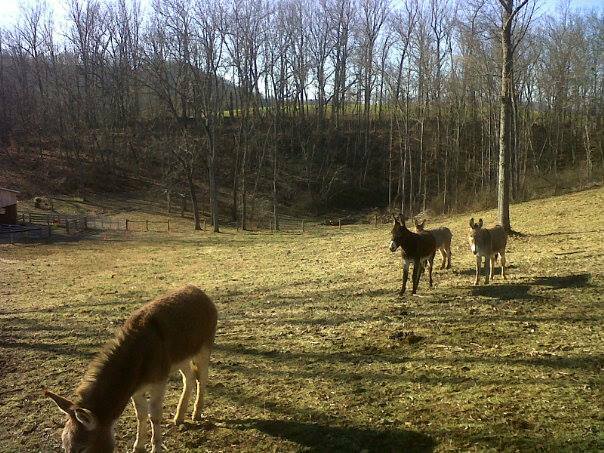 I’m so glad the herd is happy now and adjusting to their new life. I’m sure that through it all, they knew they were loved. And I’m sure you gave them PLENTY of hugs, kisses, scritches, (Paco treats? ), and praise after the whole ordeal was over. Thank you for sharing this. You know you had many of your blog followers praying for safe travels for you as well. I would not have survived the stress…and that was just the beginning of your woes. When do we get Chapter II? Hopefully by Spring, this will all be a distant memory. And I thought that you had missed all the bad weather on your trip!!! Wow, wht an adventure! So glad you, Don, your Mom and all the critters made it saely. 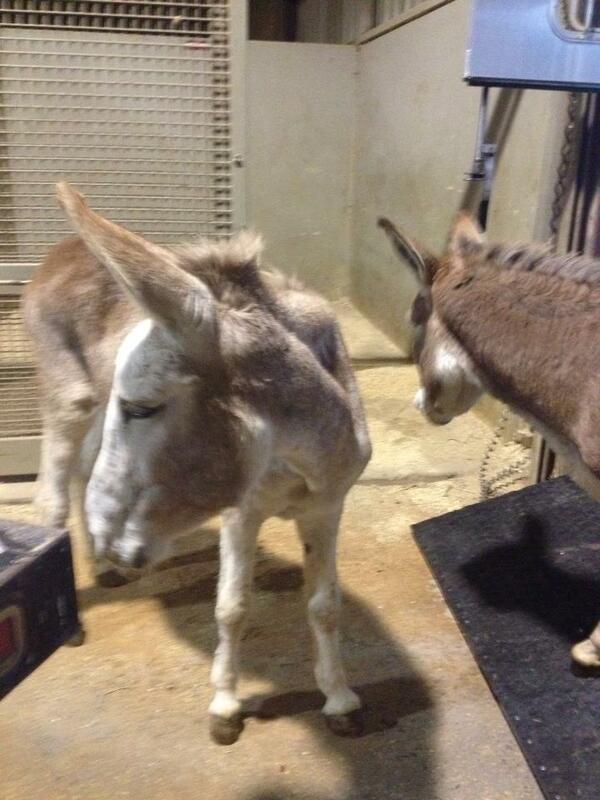 Looking forward to hearing donkey and Meggie Moo escapades from your new home. Oh my gosh! Thanks for sharing your hair raising adventure with us. Glad to hear you all arrived safe and sound in the beautiful state of Virginia. I enjoy following your blog from Washington state. You bring back many, many memories of moving following my husband’s career around the country. But, I never had to haul large critters…just kids and the vast array of house pets (dogs, cats, including a snake and hampster, left the toad and wolf spider in Tulsa). One of our cats died on the road from the stress of being crated so we had to bury him in a truckstop dumpster (cold, frozen winter). Kids crying, me crying. Poor Harley wondering what he was doing to his family. I never wanted to move again! Glad you all made it safely. Sounds like a bad movie with all the problems. LOL. Wow. Holy stressful! What a blessing that your herd was in such capable hands and that everyone arrived safely. I’m sure there was much discussion amongst the donkeys about what was happening and where they were going. It’s so hard not being able to explain things to our animal friends, isn’t it? I’m sure everyone was glad to be in their new home. Yay for all the angels along the way that watched over all of you. I am so glad you all made it across country, I was worried for you. I moved horses from Vermont to Ca once and it did not have a happy ending. I don’t know that I would ever be able to try it again, especially not with the kind of weather you had to deal with. Thank goodness you had such a great trucker, it makes all the difference. Goodness, your nerves must have been well and truly frazzled at the end of such a journey! So glad you and the critters made it to Virginia safely, but your story did it for me. I’m never, ever moving. Ever. Love Moo in the motel!